Terrapin Beer Company makes a beer called Liquid Bliss which is a chocolate and Peanut butter Porter. I used it in this Thai style curry dish because it gives just the right touch of both chocolate and peanut flavors as well as adding a nice full bodied tone. 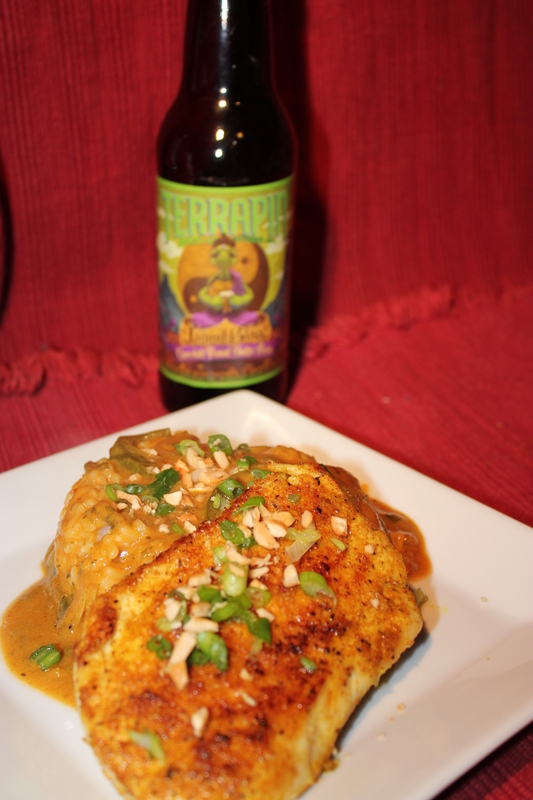 The sauce itself is rich and creamy with both the sweet and spicy flavors shining through . The chicken is seared in a rub with flavors that both complement and enhance the sauce. Directions to make rub: Place all ingredients into a medium size bowl and using a whisk or fork combine well. Pat dry the chicken and coat well with the rub. Set aside while preparing the curry sauce. Place 4 quart pot over medium high heat, add oil, onion, bell pepper and minced garlic. Stir for about 1 minutes until vegetables start to soften. Add salt, black pepper, granulated garlic, crushed red pepper, curry powder, ground ginger, brown sugar and Kefir lime. Stir for one minute. Add Beer, vegetable juice, chicken broth, coconut cream and cilantro. Stir to combine. Bring to bowl and reduce heat to simmer. Simmer for 20 to 30 minutes or until it reduced down to 2/3 its original volume. Beat the egg in a small bowl, whisk in the lime juice. Slowly add some of the curry sauce to the egg to temper it. Then stir the egg mixture into the curry sauce. Allow to simmer for 2 more minutes stirring constantly. About 15 minute before sauce it ready, Place a large sauté pan over medium high heat. Add olive oil and once hot place chicken breasts in the pan. Sauté on each side for 4 to 5 minutes or until cooked through. Remove from heat and allow to rest for 5 minutes.